Does not cross-react with AMPK alpha 1. Synthetic peptide (Human) - which represented a portion of AMP activated protein kinase, alpha-2 catalytic subunit encoded within exon 7. Our Abpromise guarantee covers the use of ab3760 in the following tested applications. WB 1/500 - 1/5000. Predicted molecular weight: 63 kDa. IP Use a concentration of 2 - 8 µg/ml. ICC/IF image of ab3760 stained MCF7 cells. The cells were 100% methanol fixed (5 min) and then incubated in 1%BSA / 10% normal goat serum / 0.3M glycine in 0.1% PBS-Tween for 1h to permeabilise the cells and block non-specific protein-protein interactions. The cells were then incubated with the antibody (ab3760, 1µg/ml) overnight at +4°C. The secondary antibody (green) was Alexa Fluor® 488 goat anti-rabbit IgG (H+L) used at a 1/1000 dilution for 1h. Alexa Fluor® 594 WGA was used to label plasma membranes (red) at a 1/200 dilution for 1h. DAPI was used to stain the cell nuclei (blue) at a concentration of 1.43µM. Immunohistochemistry (Formalin/PFA-fixed paraffin-embedded sections) - Anti-AMPK alpha 2 antibody (ab3760)Image courtesy of an anonymous Abreview. 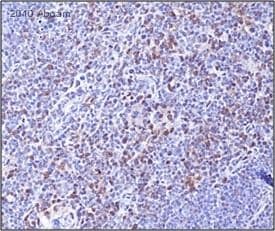 ab3760 staining AMPK alpha 2 in murine thymus tissue by Immunohistochemistry (Formalin/PFA-fixed paraffin-embedded sections). Tissue was fixed with formaldehyde and a heat mediated antigen retrieval step was performed using citrate buffer. Samples were then blocked with 2% BSA for 1 hour at 25°C followed by incubation with the primary antibody at a 1/100 dilution for 18 hours at 4°C. An HRP-conjugated anti-rabbit was used as secondary antibody at a 1/50 dilution. ab3760 presents in both the nuclear and the cytoplasm in mouse thymus. 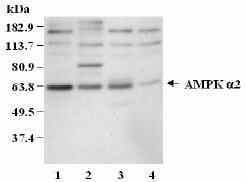 Antibody: Affinity purified Rabbit anti-AMPK alpha 2 (ab3760) used at 2ug/ml (1/500). 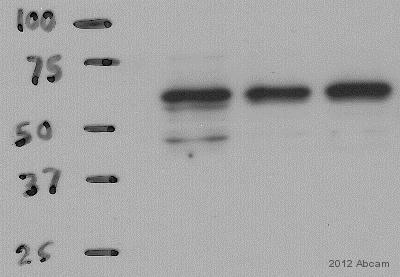 Western blot - Anti-AMPK alpha 2 antibody (ab3760)Image courtesy of an anonymous Abreview. Lysates/proteins at 24 µg per lane.